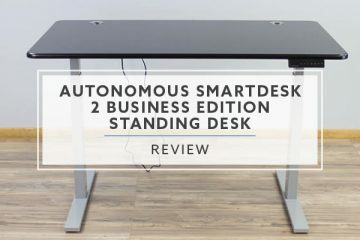 Today I will be giving an honest review on BTOD’s own brand of electric standing desks, the VertDesk v3. Sorry, I don’t plan to tell you this is the #1 standing desk, like many of the other brands you’ll find online. While a lot of time was devoted to the development of this product, I realize it’s not the best fit for everyone. 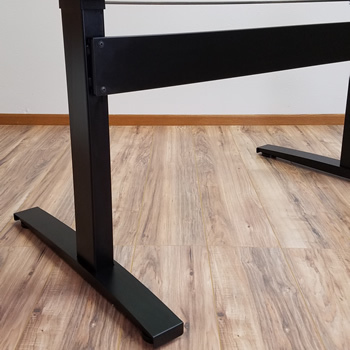 Our goal was to create a standing desk that was solid, removing the wobble found on many standing desks. The VertDesk v3 does not have the largest range of motion or advertise a weight capacity exceeding 300 pounds. My review will take a closer look at what the v3 has to offer and what it might be missing. Ultimately, letting you decide what is best for yourself. Like many of the other standing desk brands available online, BTOD does not actually manufacturer the VertDesk. We work with a US based OEM manufacturer, K&A Mfg., Inc.; a company we’ve done business with for over 12 years. They are the manufacturer of RA Products, which includes the premium NewHeights standing desk brand. I am personally a little biased towards their products and standards because the owner of K&A also happens to be my father, Bill Knighton. He has been in the industry for thirty years and continues to set a high bar for quality. After offering the NewHeights brand for almost five years, I had realized we were missing a large segment of the population. Don’t get me wrong, they are excellent standing desks, but they were too expensive for the masses. We needed to produce something that was good quality, but for a lot less money. While in Germany for a trade show called Orgatec, we met a small Taiwanese frame manufacturer. They would end up producing our v1 and v2 frames. While there, we also found the Chinese company who would provide the electronics, TiMotion technologies. My father was never excited about this partnership as he is very strict with quality on his US made products. In July 2012, the VertDesk v1 was finally available in the US market. Because it was one of the only inexpensive standing desks, it was an instant success. Unfortunately, TiMotion electronics became an issue sooner than later to work with. While TiMotion attempted to work with us, we ultimately had to switch to a more expensive option from them. After continued issues with these updated electronics, the VertDesk v1 needed a change. 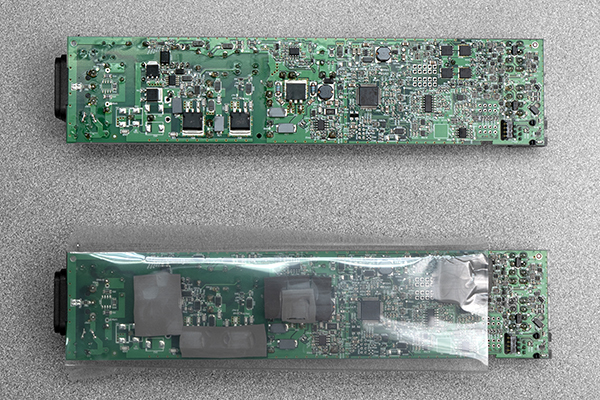 With help from LogicData, the European electronic manufacturer used within the NewHeights desks, we were able to stop using Chinese electronics. In October 2015, the v2 would see an upgrade for all electronic components, utilizing the same quality brands used in the NewHeights line. We have now made the final step towards what I believe is our best VertDesk. The VertDesk v3 frame is produced by a Taiwanese company that my father has worked with for over 20 years. During that period of time, they have produced metal components for some of K&A Mfg’s own high quality furniture. Now all of the components on the new VertDesk v3 are shipped to the USA, then assembled at the factory in Wisconsin. This allows us to maintain better quality control. The assembly of the newest VertDesk has been simplified. With pre-assembled feet and upper supports, you are left to install the motor, hex rod and cross support. However, it is not perfect and inserting the hex rod into the leg opposite the motor can be a little tricky. If they are not perfectly aligned, you may need to use a wrench to assist. With the use of a wrench, you can turn the hex rod about 1/12th turn and then easily slide it into place. Attaching the top and electronics will add an additional fifteen minutes. With the development of the frame, stability was the most important aspect of the entire process. At one point during testing there was more travel, reaching 49” tall. However, as the legs expanded, the lack of overlap between them created a motion front to back. This led us back to the 47.5” max height we are at today. It’s disappointing, as we would like to be able to offer this desk for taller user. However, the end result is a desk that is rock solid at almost every height. Front to Back: The desk is sturdy through almost the entire travel motion. Once you get to 46” you begin to notice the front the back motion. It isn’t dramatic, but it is noticeable and gets more noticeable at max height. If you are taller than 6’3”, this could potentially be a problem. Left to Right: The wobble, or left to right motion, is one of the most prevalent problems with standing desks. The VertDesk v3 excels here and has almost zero movement when fully extended. Note: It’s very important with all adjustable standing desks to fully tighten all hardware. If there is hardware that is not completely tight the movement experienced when extended to standing height will be exaggerated. We attach our upper supports and feet to the column (legs) with strong welds. 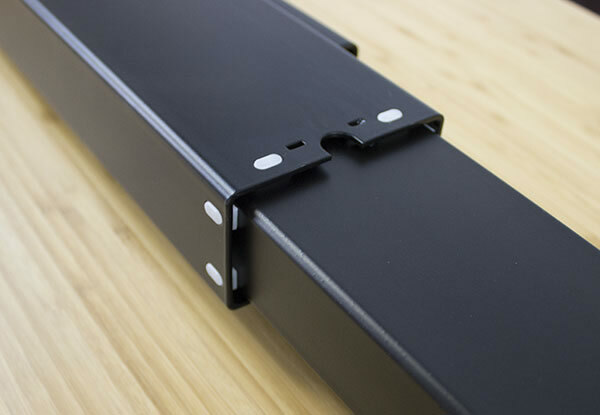 These are permanent and provide the most secure connection, the majority of other products use screws to connect these parts. Left picture shows column inserted into foot. The column is then welded to the foot. The right picture shows the upper support welded to the column. Having high quality electronics on your standing desk is important. When the electronics fail, electric standing desks cannot be moved manually. Where it stops is likely where you will be using it until replacements can be sent. 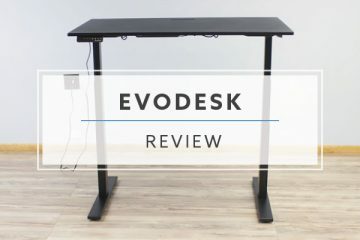 While most of the mid-range standing desk companies are using low quality electronics, the VertDesk v3, ModDesk Pro and UpDesk Elements are using high quality electronics. We have most recently partnered with Laing Innotech GmbH & Co. KG. Laing Innotech GmbH & Co. KG was founded by Karsten Laing. Prior to Karsten starting Laing Innotech, he had spent the previous 30 years building his first business that engineered and manufactured electronic systems for the heating, spa and computer cooling market. The Laing Group grew to become the market share leader of electronically commutated circulators in the pump market. At their peak, the Laing Group produced and sold 600,000 ciculators annually to the heating and spa market. Ultimately, in 2009, the Laing Group sold to Xylem Water Systems. After selling to the Xylem Water Systems, Karsten shifted his focus to the production of control box technology. To ensure this new company maintained the same level of quality as his previous company, Karsten hired on his lead electronic and software engineers from the Laing Group. By 2015, Laing Innotech started to offer their own control box technology for the furniture industry. One of their control box applications is specific to height adjustable desks. His latest product features gyro sensor technology for a higher level of anti-collision precision. This GyroSense control box system also creates the opportunity for better connectivity for future cloud based applications. Laing Innotech GmbH & Co. KG has offices in Germany, with all production of the control boxes being done just outside Budapest, Hungary. 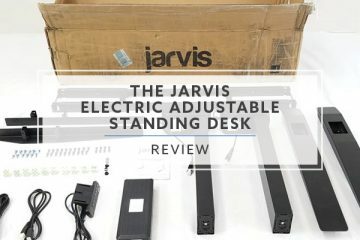 As I’ve discussed in previous reviews and comparison, we’ve found two different types of circuit board systems used with electric standing desks. Of the 20 plus control boxes we’ve examined, the single board system has shown a higher level of quality than the less expensive two board systems. That is the case with the new VertDesk circuit board as well. The VertDesk features a single board system that was engineered by Laing Innotech specifically for use in the electric standing desk control box. 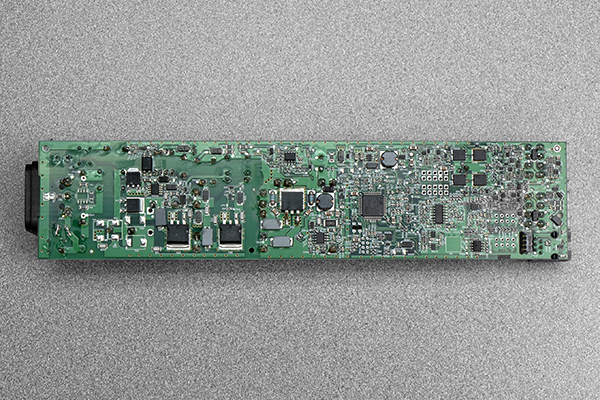 A four layer circuit board was used to maximize functionality and create a small footprint. 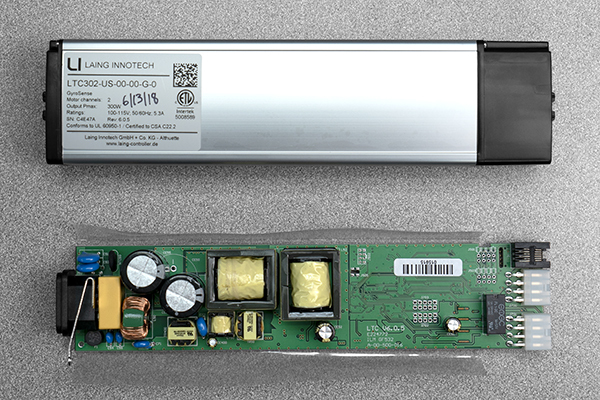 The components are securely fastened to the circuit board with solid platforms and permanent soldered connections. The only real weakness we found with the board is the way the toroid core had been wrapped. Coming from a LogicData board, that had perfectly wrapped wires in copper, the one on the VertDesk wasn’t perfect. There is some overlap to the wrap that could be improved upon. We are currently working with Laing Innotech to improve on this and should hopefully be closer to the LogicData in future iterations. 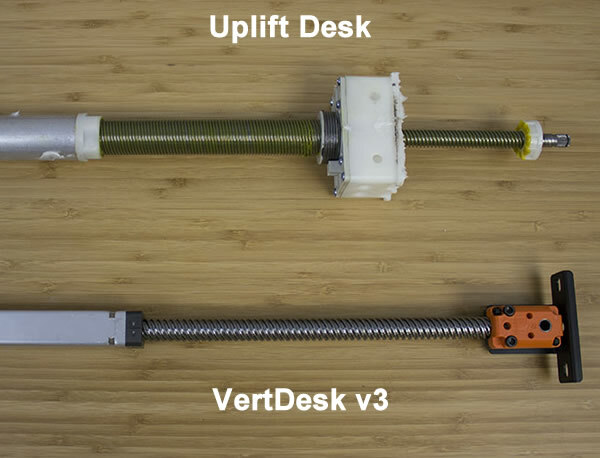 All VertDesk frames now come standard with the GyroSense technology. The GyroSense system utilizes an integrated gyro sensor within the VertDesk control box. This gyro sensor driven system provides us with what we believe is the best anti-collision option currently available on the market. We found the GyroSense system to be better with soft collisions and off balance loads than our previous LogicData system. Understanding how the gyro sensor functions better illustrates why it is so much better. With the new GyroSense system, we are able to use any starting plane of the desk as the perfect level position. This means that if your table were slightly off because of an off balance load, the gyro sensor will consider this the new perfect plane and function normally. Only when the surface plane changes while a desk is in motion, will the anti-collision system trigger and reverse the desks course. Our previous solution was driven by software, which didn’t provide as sensitive of a solution as we needed. This software driven solution is still the most commonly found anti-collision system being used in the market. This system works off spikes in the amperage while the desk is in motion. When an electric standing desk starts its motion up or down, there will be a certain amount of amps drawn. When the desk hits a hard surface, the desk will experience a spike in amps because of the blocking that is occurring. Hard collisions will show the biggest spikes, but soft collisions only show a more gradual rise in the amps as the blocking slowly occurs. Because of this, soft collisions are harder for the software drive system to recognize. There is a fine line drawn with how sensitive manufacturers can set their anti-collision with the software driven system. Because they trigger off a change in amperage loads in the columns, binding issues can create significant false positives. As any tables age, glide systems break down and tables begin to naturally bind. Lower quality tables will experience some of the worst binding, but all tables can have issues at some point. Most of the current control box systems do not have the flexibility for customers to adjust the sensitivity through their control pad. These false positives have created headaches for customers and manufacturers; this ultimately can require control boxes to be replaced. The most common solution being a significantly reduced sensitivity to the anti-collision system. If you are using a one-touch system, on this less sensitive system, it can create a major safety concern. Also, if the brand has a short warranty on electronics, it likely means you’ll be investing in a new control box. With the introduction of the GyroSense technology, we have released the one-touch functionality on all VertDesk products that use our programmable switch option. This is something that has been asked by our customers and we are excited to have this option is currently available on all two-leg frames. This new solution is a safer than most alternatives, but it’s still important to understand the risks associated with one-touch functionality. Like previous versions, the VertDesk programmable switch offers four preset positions, a standard up/down switch and a digital readout. The VertDesk’s one-touch functionality has the option to be turned on or off. If you have small children and are concerned with the safety aspect, we recommend turning this option off when not in use. To prevent users from accidentally triggering the one-touch system, we have a long press required to start the desks movement. This long press is designed to demonstrate intent when making an up or down movement to the desk. Overheating concerns are a common problem for the enclosed control box systems found on electric standing desks. Our previous LogicData control box system was like the vast majority of alternative brands currently available. With a black plastic housing, heat wasn’t easily able to escape the control box. Because of this, you will find that the common duty cycle is 2 min on/18 min off. This means that for every two minutes you cycle the desk, the desk will require 18 minutes of rest. For that 18 minute of period of time, the desk will not function up or down. Laing Innotech took a different approach with the design of their GyroSense control box system. The VertDesk control box is now housed within aluminum with added heat conductive pads attached to the underside of the circuit board. These heat conductive pads press to the aluminum housing, allowing them to transfer the heat to the control box and then dissipate to the outside air. This change allows us to cool the electronics faster. Because of this quicker cooling process, the VertDesk does not require a long down time if overheating occurs. In order to create a desk that provides good stability, the build quality throughout the entire frame is important. This includes the feet, column, upper supports and cross support system. 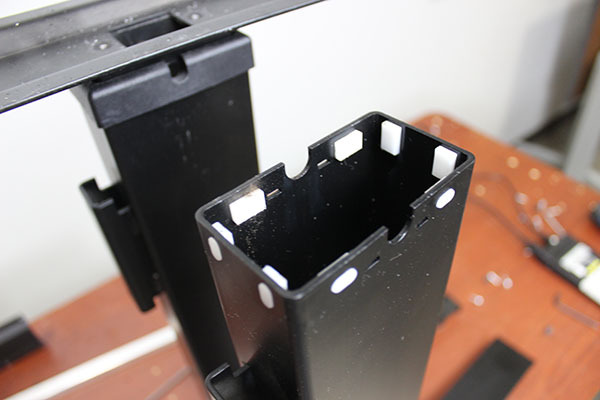 The VertDesk v3’s build quality is above average, with consistent welds to hold the heavy steel components together. The amount of moving parts also plays an important role in the stability of the desk. Standing desks with a lot of bolts, to hold pieces together, have the potential to loosen over time. More permanent solutions with solid welds are the best option for a secure connection. 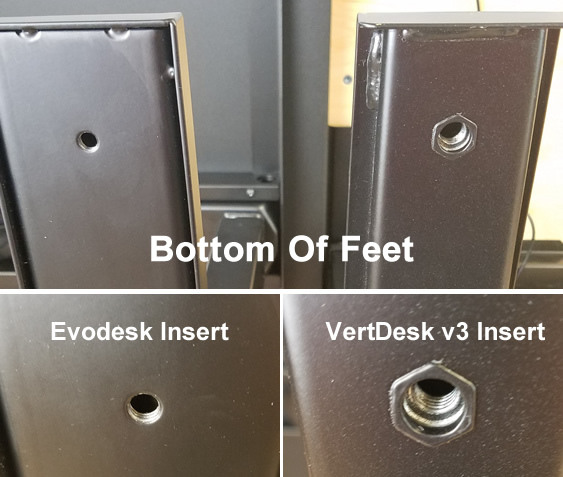 Looking closer at the VertDesk v3 feet, each foot is well built with consistent welds. Secondly, threaded riv nuts are used to attach each adjustable foot glide, providing plenty of threading for a solid connection. Lower quality alternatives choose to tap the steel plate in the bottom of their foot. Unfortunately, this process only provides minimal threading which creates wiggle in the glide. Because the entire desk frame rests on top of these glides, stability here is key to the desks overall stability. The next section of the frame is the column itself. The VertDesk’s paint finish is consistent throughout with the seam on the column barely visible. 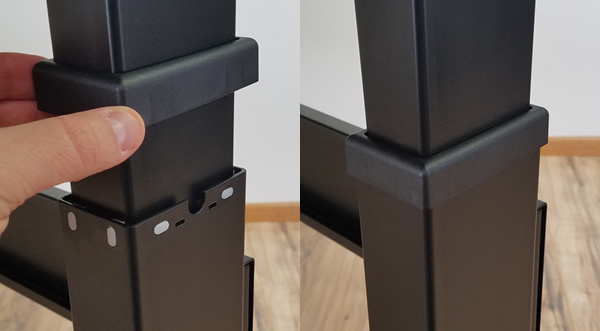 The column is welded to the foot and upper work surface support for a more secure connection. These welds are consistent and will not loosen over time. The gap between each of the columns is covered with a plastic cap that clicks into place. While this does the job, it is the cheapest part on the entire frame. It blends well and you most likely would not notice it. The last part of the frame is the cross support. 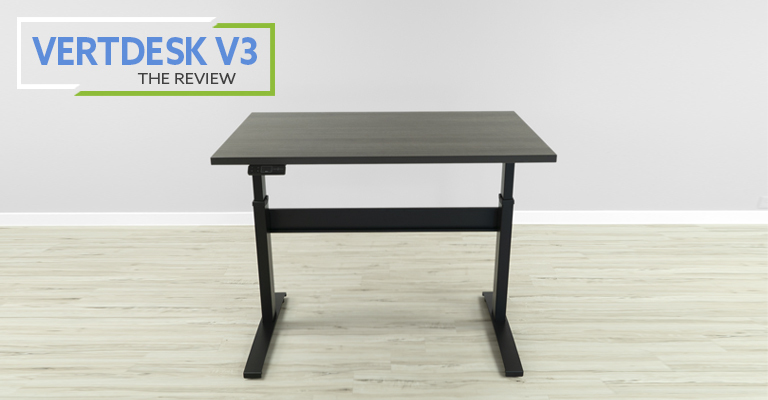 Made from steel and formed for added rigidity, the VertDesk v3’s traditional cross support is solid. At 4.5” tall, the cross support was designed to provide maximum lateral stability. Shorter cross supports have the potential to twist and we felt 4.5” was the perfect height. Unfortunately, the cross support is not expandable and requires a specific size for various sized tops. The reason for this was to create the most stable cross support. Having too many moving parts, with the cross support, significantly reduces its effectiveness. While its single piece design created a more expensive desk, it is also a major component of the VertDesk’s superior stability. The gear system of a standing desk is a key component to creating a desk that moves smoothly and can safely support heavy loads. Lower quality gears will typically have plastic parts that are load bearing. These are most commonly the weak points within the gear system. The VertDesk v3 features a single stage spindle gear system from leading German manufacturer Ketterer. In order to manufacture a gear that is not only durable, but extremely smooth, Ketterer cold rolls their steel spindles. The gears are then case hardened, a process in which a thin layer of more durable steel is added to further reinforce the teeth of the gear. This process has been proven to create stronger components that extend the life of the product. After cycle testing the VertDesk v3 for 21,375 full up and down cycles, the Ketterer gear was close to the same as new. The only differences being the amount of oil visible on the gear and the input of the bevel gear showing some signs of wear. With the cycle tested gear pulled out, we were able to pull the gear in and out to test how smoothly it functioned. Much to my surprise, the gear functioned almost as smoothly as it did brand new. With over 20 years of cycles performed on the gear, I was honestly impressed with how well it held up. The glide system on a standing desk is often overlooked. If you are like most users, it’s something you have never really considered. Without glides, the metal on metal columns would have significant issues sliding smoothly while adjusting heights. Because standing desks require inner and outer columns, the gaps created between each creates awkward play. Glides fill these gaps, reducing play that would other create stability issues in all directions. All glides are not created equal though and using high quality plastics plays an important role. Cheap glides tend to wear down quicker and require a lot more lubrication to function properly. 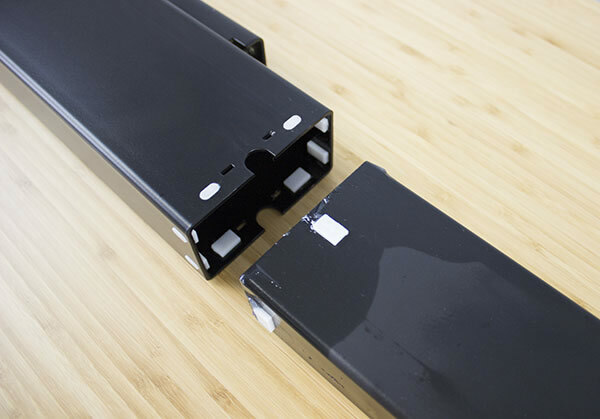 The VertDesk v3 features custom fit glides that are made from Delrin acetal by Dupont. This type of plastic is designed for applications where low friction and high durability is required. Because Delrin is used on the VertDesk, minimal lubricant is required, specifically on the upper glides. The acetal glides slide against paint on the upper column that also helps to reduce friction. The combination of the paint and acetal glides means that minimal lubricants are required on the visible portion of the column. This creates a much cleaner and consistent experience with the VertDesk v3 columns. Through the cycle testing of the VertDesk v3, we can verify that this plastic does in fact hold up well through high cycle counts. After 21,375 cycles, the glides lost minimal material, allowing the VertDesk v3 to remain stable after a lifetime a cycles. 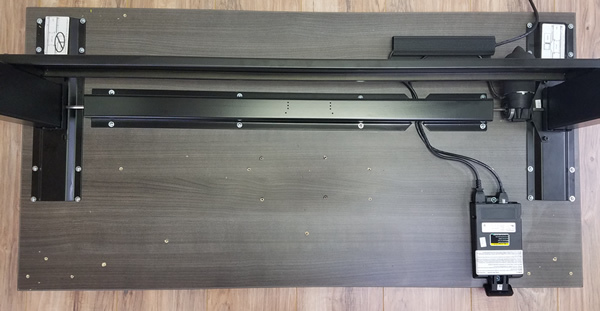 The range of motion for the VertDesk v3 is currently 20”. The additional half inch is from the adjustable leveler glides on the bottom of the foot. It’s important to note, when these are extended the desk becomes less stable. The desk consistently hits the 1.55”/second speed. Only when loaded with more than 200 lbs. does it begin to slow slightly. This was accurate. While it is noticeable in a quiet room, it isn’t an annoyance and wouldn’t be an issue for most people. We tested this weight capacity and it has no problems lifting 275 lbs. The speed slows down to 1.35”/second when fully loaded. Note: We removed the load protection on the control box to test max weight. We put 350 lbs. on the desk and it still had no problem lifting it, with a speed of 1.27”/second. 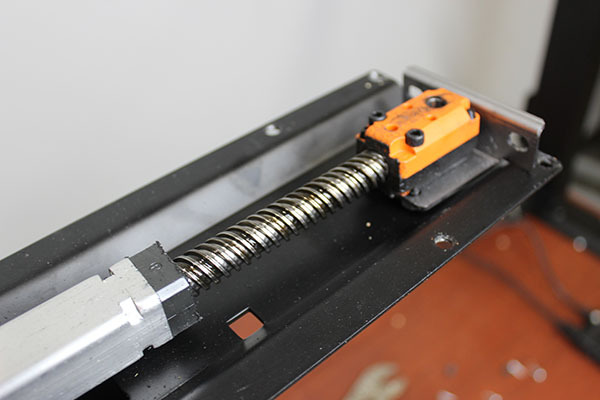 We were impressed considering it is only one motor with a single hex rod driving both legs. Overall Stability: With the focus being on stability, it’s no surprise this is what I like most about the desk. It’s my biggest pet peeve with standing desks and we finally have a VertDesk that doesn’t wobble. Adjustment Speed: While this isn’t a deal breaker, spending less time moving the desk up and down is nice. Premium Electronics: Using premium electronics is very important; it means that customers will have desks that function well for a long time. Partnering with Laing Innnotech provided an upgrade in functionality for the VertDesk from a company with a proven history in the electronics manufacturing field. Warranty: While a five year warranty isn’t the best in the industry, it’s still very good. Because the motor is external, replacing it can be done in the field by the customer. This will get the desk up and running again sooner than competitor desks with internal motors. Adjustment Range: With 20” of height adjustment, the VertDesk v3 will not fit everyone. In fact, if you are under 5’6” or over 6’5” you might want to consider something with more travel. Increased Weight Capacity: Having tested the desk to 350 lbs., it would be nice to show this capacity off. However, for long term consistency I understand it’s best to offer a more conservative capacity of 275 lbs. Plastic Caps on Columns: While most tested do not have any play, some did and it would be nice if they were all consistent. Assembly of Hexrod: Having a hex rod to drive both legs requires a little more work for assembly. Using a wrench you should able to insert the hex rod into the leg opposite the motor without issue. For some this may require an extra pair of hands. 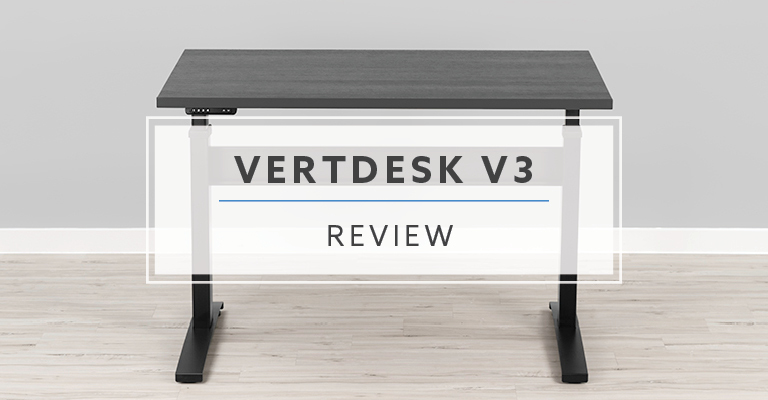 Overall the VertDesk v3 is a major improvement from previous versions. The old design of the frame had wobble issues and aesthetically it was in need of a makeover. The latest desk is our most stable standing desk and its stability compares favorably to desks more than twice the price. Depending on how tall you are and how much weight is used on the desk, there could be issues. While the VertDesk might not be perfect for everyone, I’m confident that our v3 is a good solution for most. VertDesk v3 vs. NewHeights XT: Which is better?